As I’ve said before, I’ve always planned for there to be three couples in the Myth of Omega series, and now that the second couple is wrapped up, we finally get to meet the last hero and heroine. The hero was first introduced in Reign To Ravage; shinno Kardos, a barbarian Alpha from the Southern Lands looking to make an alliance with King Malloron. The heroine we don’t meet until Reign To Rule, and she is a servant who no one suspects to be an Omega. She is quiet and unassuming, but clearly loves her sister and tries to protect her by offering herself when her sister is about to be taken by the shinno (you’ll have to read Reign To Rule if you have no idea what I’m talking about!) One things is clear, this heroine is NOT like the other two in the series. This trilogy takes place in a brand new part of the known Lands that we’ve heard about but is shrouded in mystery: the Southern Lands. These people are almost like a world of their own and it’s been so. much. fun. delving into a new culture! Assume nothing! The Own books take us to yet another continent within the Myth of Omega world that is completely different to the Crave trilogy and the Reign trilogy. The whole culture and society has its own set of rules and expectations and is organized into tribes. There isn’t a big focus on magic, but potions are relied upon a lot. The society and interactions between the hero and his people are very different from the previous books. Culture and tradition play a big part in this story because of who the shinno is. There will be three books for Kardos and Shaya. There is no need to have read the Crave or Reign books to enjoy this one, so anyone can jump in. This story is set in a dark fantasy world but, as always, is ultimately a romance. Kardos and Shaya, yet again, have a different dynamic to their relationship than the other two couples in the series. So what’s different? Shaya is a sweet but savvy heroine, not feisty like Amara or sassy like Cailyn. Kardos negotiated for the heroine but we don’t yet know what he wants her for. Shaya (perhaps naively) volunteered to take the place of her sister–she knows she will suffer and struggle. 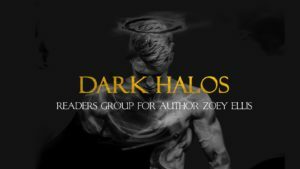 For all the release week excitement, make sure you’re part of my reader’s group, Dark Halos via email or Facebook and don’t forget to preorder your copy!